Tamil Tiger rebels have launched an air attack on the Sri Lankan military's main base in northern Jaffna peninsula, killing at least six soldiers. The rebels said they used two light aircraft to bomb Palaly base. The air force said the soldiers died when a rebel bomb hit a bunker in the base. It said the attackers had been driven away by gunfire on the ground. 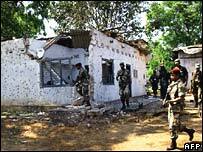 The attack is only the second time the Tamil Tigers have used air power in their long conflict with the military. The vast Palaly military base acts as headquarters for operations against the rebels in the north. It is also the supply base for tens of thousands of soldiers stationed in the region. 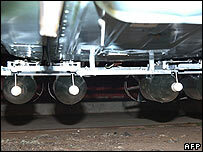 The Tamil Tigers and the military said the air raid was carried out in the middle of the night. The rebels' military spokesman, Rasiah Ilanthiriyan, said two aircraft flew over the base and dropped bombs. He said the airstrip and a storage depot were hit. According to the rebels, the pilots returned safely and reported that their attack had left fires burning on the ground. At first the military denied any such incident, but later said that a single aircraft had been spotted flying towards the base. A spokesman said anti-aircraft batteries on the ground fired and the plane turned away before it hit its intended target. Cabinet Minister Jeyaraj Fernandopulle visited the site of the bombing later and told the BBC Sinhala service the rebels had dropped three bombs "but two of them were off target". "The other bomb was dropped on one of the bunkers from which the military was firing at them. Six soldiers who were in the bunker were killed as a result." The military says the rebels were also firing artillery in the area at the time. In separate violence, at least five people were killed and 35 injured by a suspected roadside bomb that hit a passenger bus. The attack - the third bombing of a civilian bus so far in April - occurred in Vavuniya district, about 250km (155 miles) north of the capital, Colombo. Vavuniya is the last government-held garrison town before territory held by the separatist Tamil Tigers, blamed for the attack by Sri Lankan officials. In March, the rebels launched their first air raid on an air force base next to the island's main airport. The Tigers later released pictures of an aircraft; a two-seater, propeller-driven Czech trainer adapted to carry bombs. The BBC's Roland Buerk in Colombo says it confirmed what analysts had suspected for years - that the rebels were developing an air capability to support ground forces and naval wing. Both the Tigers and the military are, officially, still observing a 2002 ceasefire which has become meaningless in practice. Violence began to increase after the 2005 election of President Mahinda Rajapakse. Since then about 4,000 people have been killed. The Tigers are fighting for a Tamil homeland in the north and east of the island.